This morning, there was a massive spider web across my garage door, of course I had to back through it to get my car out (pretend the open garage door is the entire picture, look dead in the center of that and you'll see a dark black circle-ish spot, that's the spider in the center of his/her web). 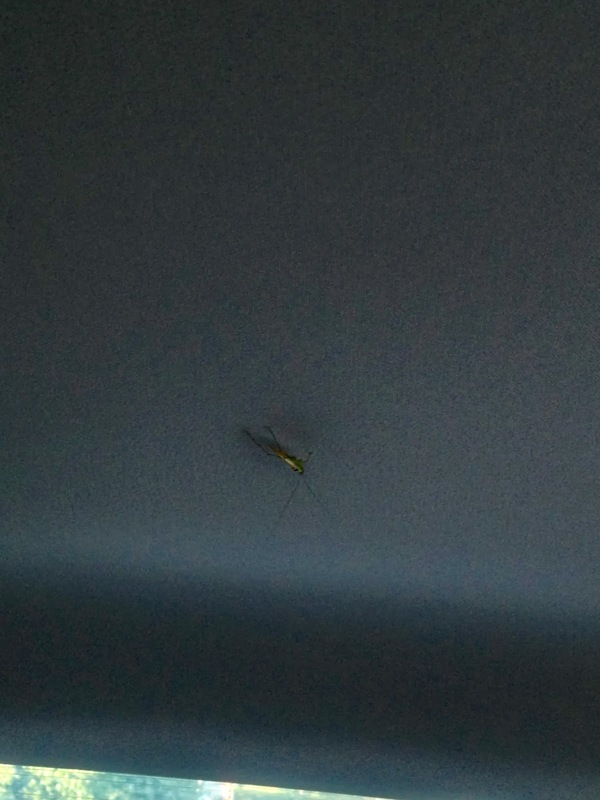 Then, as I'm backing up I notice this little, teeny tiny grasshopper in my back seat. 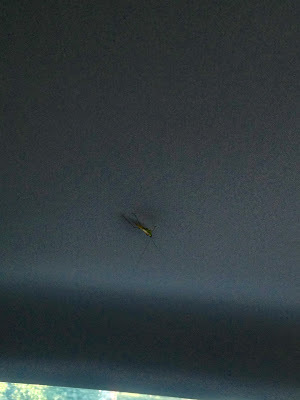 Once I'd backed out, and pulled a little away from the spider who's web I'd just decimated, I chased him out of my car. Then, I came home and Mr/Ms Spider had completely rebuilt across my garage door again. I hate destroying what would typically be a pretty awesome setup for a spider (especially since my car doesn't get out much), but my car isn't going to stay outside so the spider can keep its web intact (the over-exposed white circle in the middle of the picture in line with the GDO tag is the spider here). 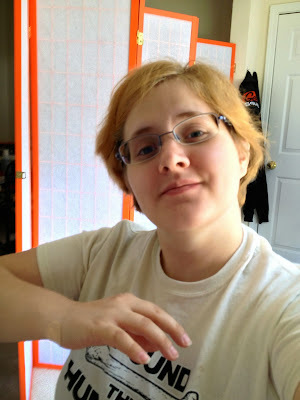 On to today's serious business, my regular doctor called me a few days ago and said that the MRI of my wrist had been inconclusive but that they didn't think there were any torn tendons (the big worry since my issues have gone on so long) so today I went to the orthopedic surgeon. So I go to the surgeon, and he looks at my wrist, does some horribly uncomfortable things, and then he says that the x-rays they did in the emergency room and the MRI that was done were all from the wrong angle and wouldn't have been able to see where I had actually hurt myself. He said he could see fluid on the MRI that was where it wasn't supposed to be, meaning inflammation, right? But he couldn't actually see the joint and bone where I'm having issues. So he sent me for an x-ray series taken at extremely specific angles (he actually came and demonstrated what he wanted for the technician while I was in the waiting room). He takes a look at the x-rays and then says that I probably broke the bone in question, but that it's so small it's already healed and the only thing left to see is the serious damage to the joint. He then injected something into the freakin' joint and said that the pain would be bad for about a day and then excruciating for about three days before it started to feel better. See the teeny bandaid there on my wrist? That hides a great big ball of fire. Holy wow.